Pie Crust - All Butter Pie Crust with the Best Flavor and Flaky Texture! This all Butter Pie Crust is simple to make, with a delicious flavor and an extra flaky texture. I know homemade pie crust has a scary reputation, but it tastes SO much better than any storebought pie crust I’ve ever encountered, and it’s really not so bad to make yourself. I actually think half the perceived difficulty is just the hype around how hard it is to make. Setting yourself up for success by moving quickly and having everything at the right temperature from the start will get you most of the way there. And you’ll be rewarded with a pie crust that’s much more delicious than anything you can get from the store. 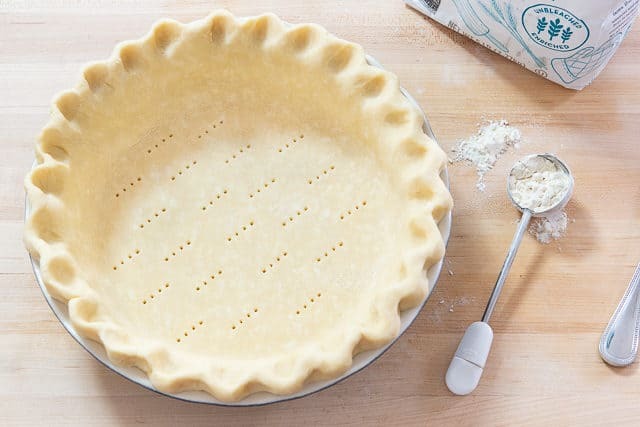 A good homemade pie crust will take your recipes to the next level, whether you’re making a savory Chicken Pot Pie for dinner or a Lemon Buttermilk Pie for dessert. Some people like to add other fats like shortening to make the crust easier to work with, but I find it’s really not necessary. First, nothing compares to the flavor of butter, and butter also gives the pie dough plenty of flakiness. Plus, shortening leaves a gross film on your teeth when you eat it. So long as you have all your ingredients and equipment ready to go when it’s time to make the crust, it doesn’t take more than a few minutes to bring the pie dough together. There are only a few components in pie crust: flour, fat, and liquid. I like a moderate protein all-purpose flour. You can check this list for protein contents of major brands. You’ll see that King Arthur Flour has one of the highest, so my recommendation is to avoid that here, to minimize gluten development and toughness in your crust. For fat, I like butter as I mentioned above. Use one that has a good flavor. If you look up butter taste tests online, you’ll see that they are definitely not all equal. For the liquid, I recommend plain old ice water. I’ve tried a lot of those pie hacks like adding vodka, and I’ve always thought the difference was negligible. 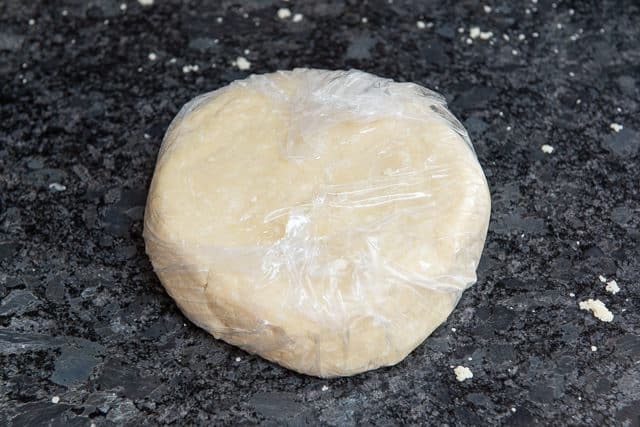 Pate Brisée-This is the standard pie dough, used mostly for savory tarts or quiches. Nut or Cheese Dough-You can add a couple tbsp of grated Parmigiano Reggiano cheese or finely ground nuts to replace a small amount of the flour in either a Pate Brisée or Pate Sucrée. Is Pie Crust Best Made by Hand or With a Machine? You can make pie crust three ways: by hand, in a food processor, or in a stand mixer. After years of testing the different methods, my favorite is to use the food processor. So long as you’re really careful not to overwork things, it is the quickest method, and prevents the butter from warming up too much. It also makes everything really even. FYI if you were adding sugar for a sweet crust, you’d pulse it with the flour and salt. But I don’t use it most of the time. 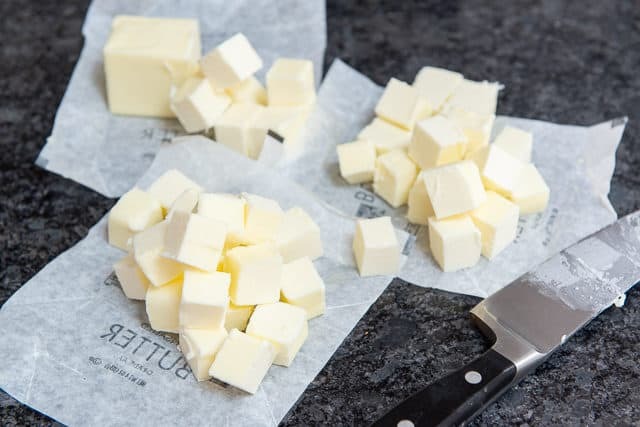 The butter should be cold straight from the fridge, and if you want, you can even cut the cubes ahead of time and keep them in the fridge, ready to go. I’ll note here that I have always used a little bit more butter than what’s standard for pie crust. The dough holds it well, and it gives extra flakiness. Pulse about 10-15 times (this number really depends on how long your “pulse” is), until the butter is broken down into pieces that are somewhere between the size of a chickpea and a sweet pea. Now it’s time to add the liquid. I like to have a “master ice container” nearby, from which I can pour ice cold water into a small measuring cup. Otherwise it’s hard to know exactly how much ice water you’re adding with the ice cubes displacing things. This is probably the hardest part to get right, knowing when to stop pulsing the dough. If you don’t mix it together enough, it will be too crumbly and won’t hold together. And if you mix too much, you may overwork the dough and develop excess gluten (which will make the pie crust tough). So try to nail that point where the dough still looks a little crumbly, but is easy to shape into a smooth, cohesive dough with your hands. 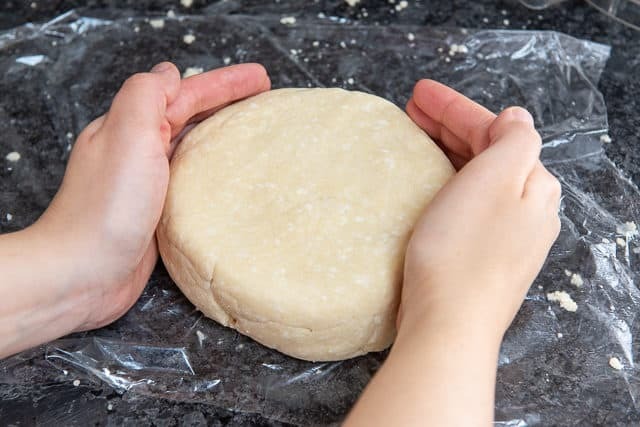 Shape the dough into a somewhat flat circle, or in preparation for whatever shape you need for later (so, if you’re making a slab pie for instance, you should probably shape it into a rectangle instead of a circle). That means flaky, delicate, and delicious pie crust! And now, chill the dough for at least one hour. Do not use the dough right away, or you’ll have major shrinking problems when you go to bake it. The chill time is essential, and you’ll learn to plan ahead for any pie recipe you make. The very most important: do not let your pie dough get warm. If you only focus on one thing, this is the one. Have your ice water ready in a jar, have your plastic wrap sitting out on the counter, and move through everything quickly, without interruptions. You want to keep the butter from melting, because if it does, you won’t get the crumbly or flaky pie crust you’re working for. Do not overwork the dough. In my experience, it is always better to have to patch little parts of the pie together a little bit later rather than have a tough pastry. Pie dough can almost always be patched together by hand, even if it’s annoying. 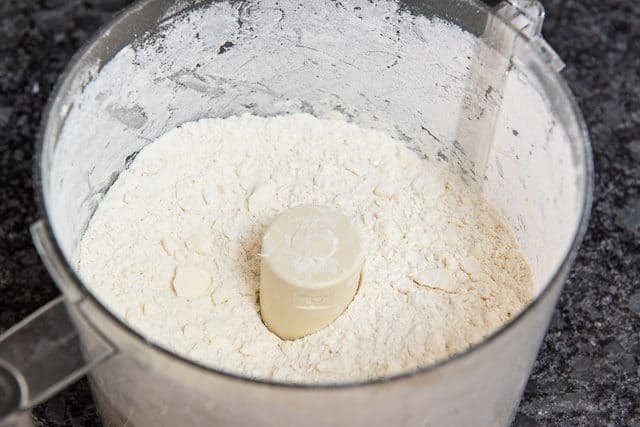 Different flours in various parts of the country have different protein/gluten contents, so you will always have to make adjustments to suit the characteristics of your flour, butter, and humidity. I’ve been making pie crust for 15 years and there’s always a bit of fine tuning depending on the conditions. 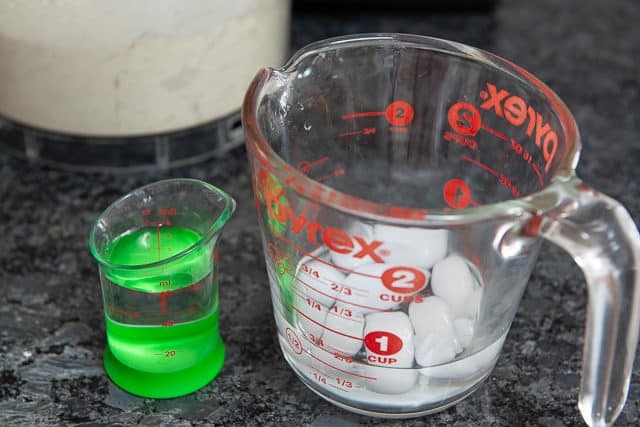 Follow the method closely, but if something looks like it needs more liquid, more mixing, etc, trust your intuition about how it looks and feels. Tomato Tart, Peach Crostata, and Broccoli Cheddar Quiche are some great recipes to make with homemade crust. Happy baking! This all Butter Pie Crust is simple to make, with a delicious flavor and a flaky texture. 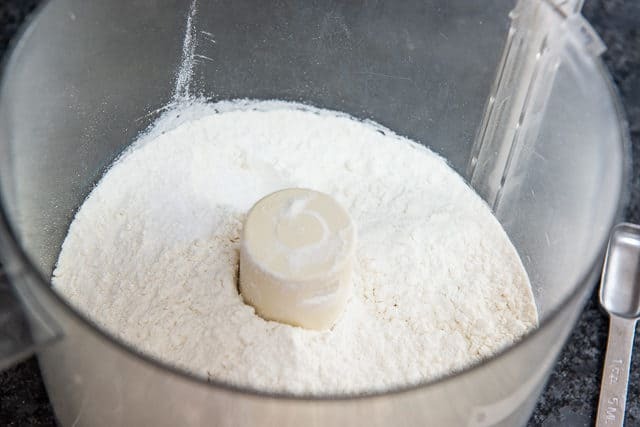 Combine the flour and salt in a food processor and pulse a couple times to aerate and mix together. Add the butter and pulse about 10-15 times, until the butter is broken down into pieces somewhere between the size of a chickpea and a sweet pea. If you have some bigger and some smaller pieces, that's great. Just be careful not to overpulse and break down the butter too much. Add 1/2 cup of ice water through the feed tube, pulsing occasionally to mix, to distribute the liquid and moisten the dough. 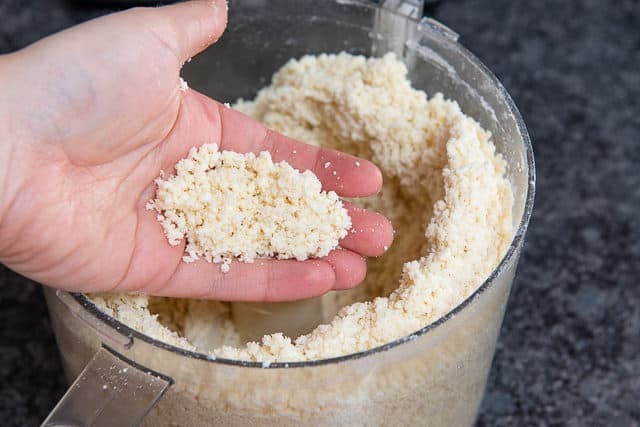 You're looking for the dough to form into moist crumbles that build up on the sides of the food processor (see photo in blog post), and combine into a smooth clump when gently squeezed with your hand. 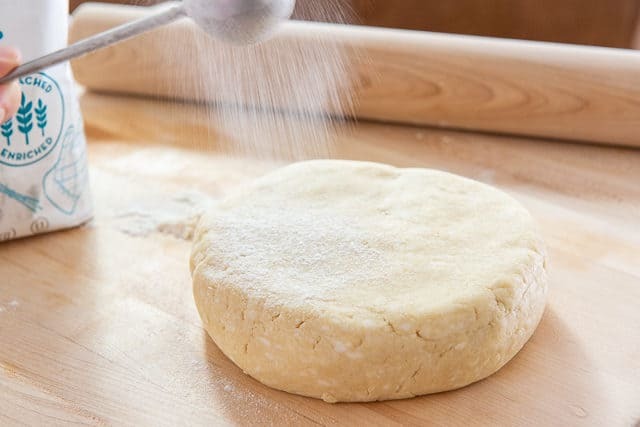 If the dough is too dry, add an additional tablespoon of ice water, and pulse, until the dough is sufficiently moistened. Repeat as needed, but you shouldn't need to add more than a few tablespoons of extra water at most. 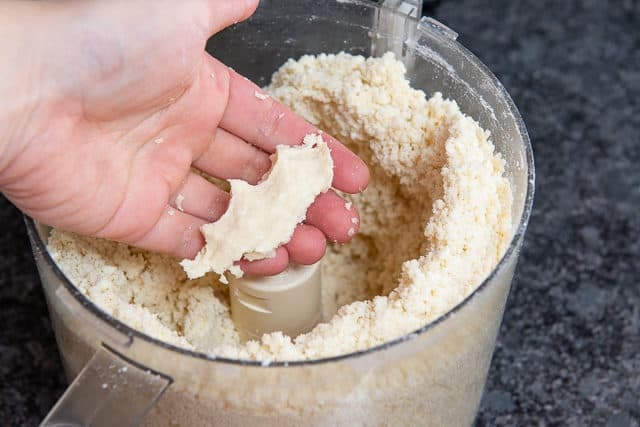 Remove the dough from the food processor to a piece of plastic wrap, and shape the dough into a flat disk or rectangle using your hands. If the dough is a bit crumbly, you may knead it gently a few times to make it smooth. Wrap the dough in plastic wrap, and chill in the fridge for at least one hour, preferably two. After the dough is thoroughly chilled (it should be firm to the touch), it is ready to be rolled and used for whatever recipe you'd like. Enjoy! Post updated in April 2019. Originally published December 2010. 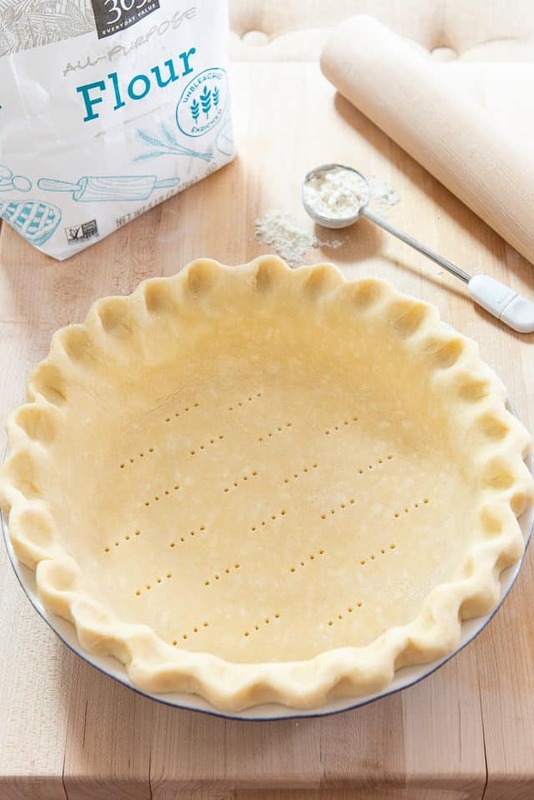 What a helpful tutorial on pie crusts! and with lovely pictures too! Great post! Piper, even if I use a stand mixer (or electric mixer), most of my recipes can be made by hand (exceptions would be something like a macaron, which is very tedious). I agree, mixers are expensive (mine was a gift) and you don’t want to lug one around while you’re abroad. 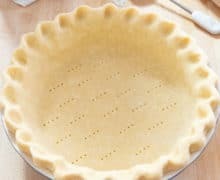 You can definitely make pie crust by hand, the issues here are the warmth of your hand (it can melt the butter, and you want to keep the butter very very cold) and the other major issue is overworking the dough. When making this by hand, if you can, get a pastry cutter (they’re not expensive) to cut in the butter (or you could try a very strong fork), and throughout the whole process, stick your dough in the fridge frequently to keep it cold. I have a pastry cutter got at a home party one time. But I always use the “2 table knife method” used by my mother and grandmother before me. Just keep drawing the two knives across each other through your shortening and flour and in a very short time (really) you have a lovely crumble. 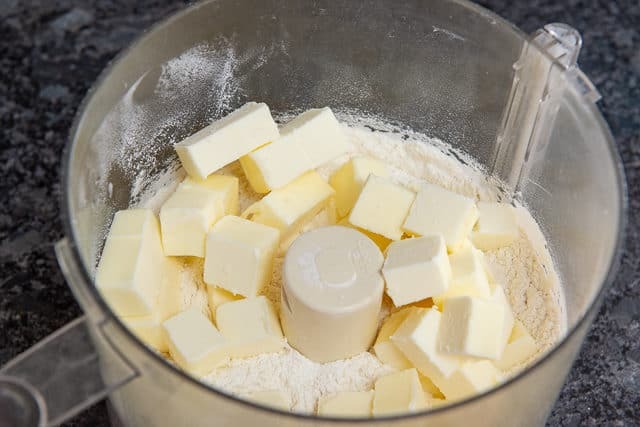 Hi Liz, If you have a pastry cutter that would work great, just make sure to try to move quickly because the butter will want to melt pretty quickly. A fork on the other hand doesn’t work so well in my experience. Good luck! I haven’t tried homemade pie crusts in ages but I really wanted a pumpkin pie last week so I gave this a try….two thumbs up, which in my house means “it was delectable”! Thanks for the tutorial! Look what a pie crust rockstar you are! Bravo =) Glad the tips helped. I love to make pies. I made 3 for Christmas, pecan, pumpkin and mince. My recipe makes 5 crusts. Above I mentioned how I mix the flour and shortening. I too believe the less you handle the better. I stir in the liquid (mine uses water, an egg and a T of vinegar) with a fork then I use a scale to weigh out the dough into 5 even portions. Wrap and store in fridge. I have always rolled my crusts out between 2 pieces of waxed paper. Never have to add extra flour to keep from sticking. Also I was taught not to roll back and forth with the pin, just continuously and gently roll out from the center. Turn crust to do this. Another hint is to use a pastry sheet that has the lines printed on it. Then you know exactly how large to roll for round or rectangle. I will make another couple pies for New Years …I am waiting for them to put in their requests. One will be a coconut cream that I made for a baby shower in October. My daughter gave me the recipe and so excellent.